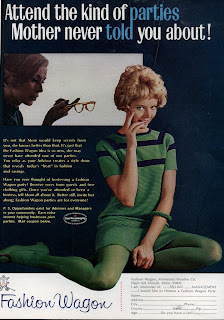 An advertisement for the now defunct company, Fashion Wagon, part of the Minnesota Woolen Company, Inc. Its intention is to get young people to host gatherings where the Fashion Wagon clothing will be sold. The thing that gets me about this ad is the look of the teenage girl. That kind of mischievous expression and references to parties "mother never told you about" makes this seem like some kind of sordid 1960s affair. It's like she's not only going to run out and read Portnoy's Complaint, but get a banana and act like Mary Jane Reed. Much thanks--again--to Al Wirtes, for his keen fashion sense.